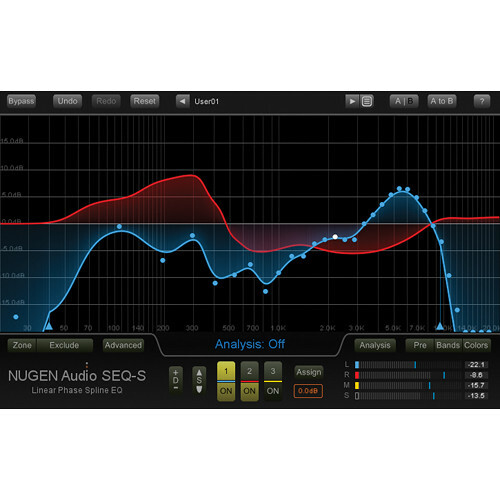 SEQ-S Linear Phase EQ from NUGEN Audio is a plug-in that provides sonic sculpting and EQ matching up to 7.1, with stereo mid-side operation and automated spectrum analysis. The software allows for manipulating and correcting any audio with higher resolution than can be achieved with a traditional parametric EQ interface. A direct-draw interface and detailed spectrum analysis make it easy to quickly identify and specifically fine-tune audio. Additionally EQ matching via sonic fingerprinting provides some unique possibilities. The plug-in can be used to match one recording to another by capturing the "flavor" of the source audio and then transferring it to the current work. This is especially useful for restoration and harmonization work. Or the same technique can be applied to individual tracks to unify different takes, microphone positions, and more. EQ Invert control delivers a minimally-invasive technique for creating space in a complex mix where traditional EQs are just too destructive. By "sampling" the vocal and applying the inverted curve to the backing, specific space can be gently created without unnecessarily altering the original tonality of the underlying audio. A "Quality Setting" provides extra precision in the low frequencies, allowing for highly transparent adjustments without muddying the mix. The resolution can be scaled to suit any task.